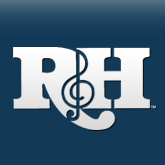 In our last issue, R&H President Ted Chapin wrote an article examining a litany of discrepancies found in the songs of Rodgers & Hammerstein, Rodgers & Hart and Irving Berlin. ""This article is about details,"" Chapin warned. ""And if you're not interested in details, move on to the next article."" Judging by the number of letters we received, along with messages sent to our website mailbox (editor@rnh.com), few readers took that advice. Instead, they read their Happy Talk -- and talked back. Chapin's article, as respondent Gerald Nachman wrote, was ""raw meat for musical freaks,"" so we thought we'd share some of these letters with you in a veritable chat-room of esoterica. ""Hold your head"" or ""Keep your chin""? Chapin tackled one discrepancy especially vexing to mavens, found in the lyric to ""You'll Never Walk Alone,"" the hymn-like homily featured twice in Act II of Rodgers & Hammerstein's CAROUSEL. ""Is the lyric, 'When you walk through a storm, keep your chin up high,' or is it, '...hold your head up high'?"" Chapin asked. ""Which is better? Which is right? Votes?"" ""'Keep your chin up high,' unquestionably,"" responded Steven Suskin. However, he continues, ""I like 'hold your head' better; it flows more smoothly. Hold-head-high is easy; keep-chin-high interrupts the flow with its hard consonants."" Bruce Miller of the College of the Holy Cross (Worcester, Mass.) music department voted musically as well: ""'Keep your chin up high' is, as most singers will affirm, more difficult to sing and project than 'Hold your head up high.' The vowels for 'keep' and 'chin' are more closed than those for 'hold' and 'head'."" Several readers analyzed the tone of the lyric which, like all Hammerstein verse, must be considered in its original dramatic setting for the fullest context. Gerald Nachman decided that ""it must be 'hold your head up high' for purely poetic reasons. It's more alliterative than 'keep your chin up high' and is a slightly nobler sentiment as befits the song; 'chin' is a tad too trivial for the grandiose lyric."" However, Bruce Miller argued that ""'Keep your chin up high' seems much more in period (late 19th century America) than 'hold your head up high.' Rather than sound like a cliche, to my mind at least it has more poignancy than 'hold your head' which invokes a more general image."" ""I have, if you believe it, actively wondered for years about [this] difference,"" confessed Brian Johnson. ""Having both lines didn't answer the question of what was the 'definitive' version for singing to oneself or around the piano with a group of friends...As for which one is right, it seems like the best default indicator would be the album. I would think we could presume that whatever Christine Johnson [Nettie Fowler in the original cast] sang in the studio was what she sang at the Majestic each night, and that Hammerstein would have corrected her at some point were she singing the wrong words."" (For the record, Johnson is heard singing ""keep your chin up high"" on the original cast album, newly reissued by Decca Broadway.) What's preserved on the cast album, ""is pretty clearly an indication of what Hammerstein wanted it to be when the show opened,"" agrees Suskin. ""But that's not to say that he didn't change it a week later."" Bruce Miller ponders: ""Perhaps it was her suggestion to revise the words, and it was changed after she recorded the song?"" Several readers suggested that various Hammerstein sources might provide the answer, with special scrutiny paid to Lyrics, the compendium first published in 1949 and edited by Hammerstein himself. ""Both the original cast album and Lyrics give the line as 'Keep your chin up high',"" points out writer John Steele Gordon. ""Oscar would have paid very close attention to the words in the original production...Likewise, I would think that he would have carefully proofread the manuscripts, galleys, and page proofs of Lyrics."" 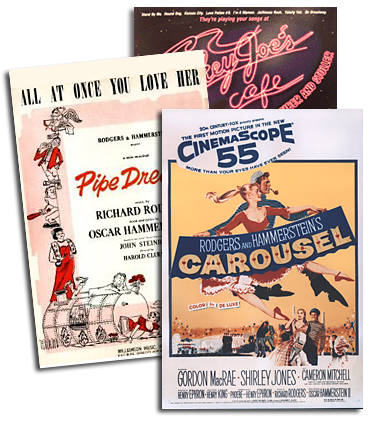 Mark Horowitz, Music Specialist at the Library of Congress, which holds the majority of Hammerstein's personal papers and manuscripts, shed whatever light he could: ""Every version in the Rodgers & Hammerstein collections reads 'Keep your chin up high' with the exception of the Twentieth Century Fox score, which reads 'Hold your head up high.'"" Before we leave CAROUSEL, a final word from Oscar Hammerstein's protege: ""My guess is that Oscar thought 'hold your head up high' was better than 'keep your chin up high,"" writes Stephen Sondheim. ""I agree with him. I think you should keep the improved phrase."" Readers responded to the one-letter difference that altered the meaning of a lyrical phrase in the title song from THE SOUND OF MUSIC: ""To laugh like a brook as it trips and falls/Over stones on its way..."" or ""...in its way""? In this case, Chapin cites a lyric manuscript in Hammerstein's own handwriting which clearly offers ""...over stones in its way."" Case closed? Gerald Nachman isn't so sure: ""I think the line would be 'on its way', because 'in its way' is a new thought and needlessly complicates a pretty image, introducing a whole new idea -- not something Hammerstein would have done (unlike Lorenz Hart)."" But Brian Johnson is relieved to have what he regards as a definitive answer. ""This always bothered me when I listened to the original cast album [with Mary Martin] since the soundtrack [with Julie Andrews] was the first album of any kind I ever owned and 'The Sound of Music' the first song I ever memorized at age 3. I couldn't conceive that 'in its way' could possibly be right and assumed it was Mary Martin's mistake, though that was not very logical of me. It will be difficult to change a lifetime's worth of 'stones on its way' singing, but with proof positive in Hammerstein's own hand, I will certainly have to try!"" Chapin offered an example of how the replacement of one word can alter the meaning of a lyric, in this case Lorenz Hart's timeless verse for ""There's a Small Hotel"" from ON YOUR TOES. An original rehearsal script contains the line, ""There's no bridal suite/One room bright and neat,"" with a pencil mark crossed through the word ""no,"" replacing it with ""a."" Writes Gerald Nachman: ""It definitely must be 'a bridal suite' because Hart is making the point that in a small hotel the bridal suite would only be 'one room, bright and neat' -- part of what gives the image and the lyric its coziness. Also, 'one room bright and neat' doesn't logically follow 'there's no bridal suite' to my ear anyway -- and it's not a romantic idea, which is contrary to the tender spirit of the lyric."" Devotees everywhere will be indebted to Robert Parrish, Chairperson, Department of Music at the College of New Jersey (Ewing, NJ). Mr. Parrish lives about 15 miles from the Stockton Inn, in Stockon, NJ, which is famed as the setting for Hart's lyric. Upon reading Chapin's article, Mr. Parrish, a self-described ""musical researcher,"" called the Inn to ascertain the configuration of its rooms at the time of this lyric's creation. His research was promising but not, as yet, conclusive. ""The Stockton Inn is not truly a small structure,"" he writes. ""It is, in fact, quite spacious... Regarding your statement about a small hotel having only one room, I don't arrive at the same conclusion as you, based on knowing the footprint of the Inn."" On the other hand, Parrish points out, an adjacent building, The Smith House, which serves as an annex to the Inn, was open for business in Hart's time. In several ways (including its views of a church and steeple), the Smith House could have been the real role model for Hart's ""Small Hotel."" However, admits Parrish, ""without Lorenz Hart around to solve this riddle, it appears that my adventure has just begun!"" From Rita Dalzell: ""I enjoyed reading about the 'quandaries.' The column was fun to read."" Gerald Nachman's e-mail concluded, ""This is great fun. Keep those lyric posers coming."" ""Thanks for bringing up these fascinating questions,"" agreed Brian Johnson, even as he brought up one more of his own: ""'Shall We Dance?' seems to vacillate often between 'with our arms about each other' and 'with our arms around each other'..."" Robert Parrish thanked Chapin for ""an engaging article...It is pleasing to know that issues of inconsistency and ambiguity are being looked at by The Rodgers & Hammerstein Organization."" And from Mark Horowitz of the Library of Congress: ""Well, I'm certainly impressed with the care you take!""